When a consumer goes on to consume the units of a commodity continuously the marginal utility derived from the successive units of the commodity goes on to fall constantly while other factors are held constant. MU is the rate of change of TU. When the MU decreases, TU increases at decreasing rate. When MU becomes zero, TU is maximum. It is a saturation point. In the above schedule MU decreases and TU increases at a decreasing rate upto 5th unit of commodity. MU becomes zero at 6th unit and TU = 30 become maximum. When MC becomes negative, the TU declines from 30 to 28 units at 7th units of a commodity. With the help of the above schedule the relationship between MU and TU can be represented in the diagram. In figure (2), MU curve moves downward having negative slope while in figure (1) TC curve, having negative positive slope moves upward but tendency to move is towards x-axis, which shows decreasing rate. A point F´ in figure (2) MU curve cuts the s-axis at the 6th unit and TU curve has its maximum point F which is saturation point. 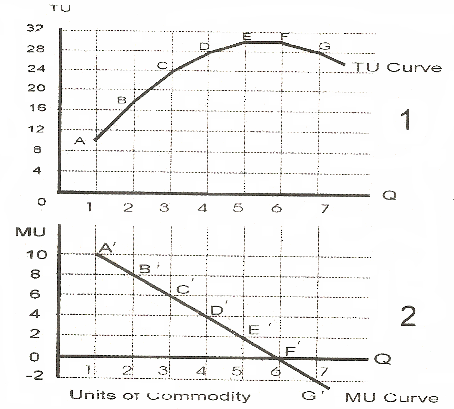 At 7th unit MU curve is below x-axis as in figure (2) and TU curve declines from point 'F' to 'G' as in figure (1). This process remains upto point E and MU decreases. It is the representation of zero marginal utility. It is the representation of negative utility and total utility declines.